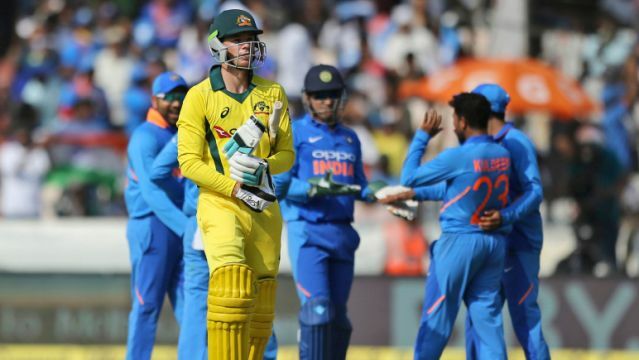 Indian bowlers controlled the proceedings like seasoned puppeteers pulling strings at will to restrict Australia to a sub-par 236 for 7 in the first ODI in Hyderabad on Saturday. It was a vastly different performance from the bowling unit which maintained discipline for the better part of the 50 overs with Mohammed Shami (2/44 in 10 overs) showing the way. Kuldeep Yadav (2/46 in 10 overs), Ravindra Jadeja (0/33 in 10 overs) and Kedar Jadhav (1/31) made up for a rare off-day by Jasprit Bumrah (2/60 in 10 overs), that too, by his standards. Even Usman Khawaja (50) and Glenn Maxwell (40)—the top two contributors for Australia—weren't exactly comfortable against an Indian attack that bowled as many as 169 dot balls. Handscomb was using his feet well but Kuldeep managed to produce a classical chinaman's delivery. Handscomb was deceived twice—first in the air and then it broke back sharply for Dhoni to complete the easiest of glovework. Despite not getting wickets, Jadeja bowled two miserly spells—5-0-15-0 and 5-0-18-0. To top it, he was hit for only two boundaries and bowled 34 dot balls. It was a tough period to bat as Maxwell and debutant Ashton Turner (21) found out during their 36-run stand for the fifth wicket before Shami got his reward in his second spell, removing both of them.